Here is a great all metal sign for the collection, that does not come around often. 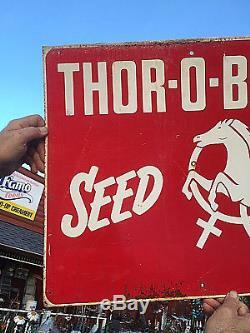 On the front of the sign there is the wording Thor-o-bred at the top in white lettering. The bottom left side has the slanted wording of "Seed" in it. 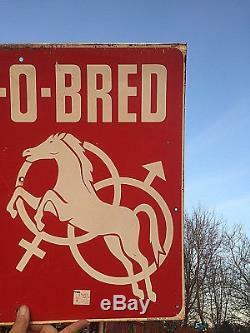 On the right side of the sign there is the graphic of a jumping horse over the male and female gender circle markers. 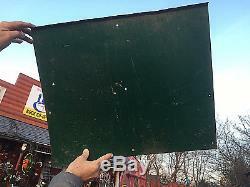 The top of the sign has a little flange to it, almost like it was used for a display rack. 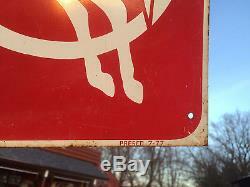 Here is a great sign to be added to the collection, the sign ha some scratches, paint ware and light rust in a few spots, but as seen in the photos the sign is ready for a collection. I to have a white inventory sticker on the sign in the lower right near the horse. It measures about 24 inches wide and 20 inches tall. If you collect signs, oil cans, cabin decor, farm signs, tractor signs, ranch, cows, pigs, chickens, swine, hog, etc, Add this nice piece to your collection. I can accept Pay Pal. Check out the other items I have listed. 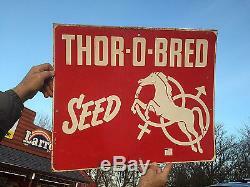 The item "Vintage Rare Thro-o-bred Metal Seed Farm Sign With Horse Stalllion Graphic" is in sale since Monday, December 18, 2017. This item is in the category "Collectibles\Advertising\Merchandise & Memorabilia\Signs\Original\1930-69". The seller is "badboyz1" and is located in Milaca, Minnesota. This item can be shipped to North, South, or Latin America, all countries in Europe, all countries in continental Asia, Australia, New Zealand.